The Geometry of design & the interplay between glass, concrete, wood and steel create a dazzling experience here. A double dose of sheer, unadulterated luxury set high up in a guarded cul-de-sac to take full advantage of the panoramic views, this incredible property hosts a second home too and is all expertly placed on 4000m2. 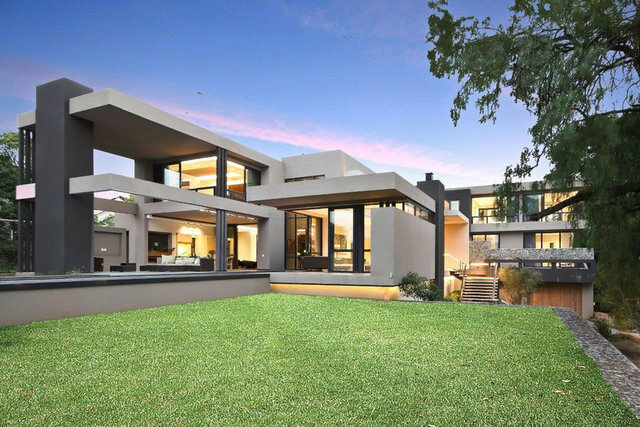 Modern, yet elegant, this is a powerful sculptural statement and must surely qualify as one of Sandton’s finest homes. The moment you enter through the oversized glass door, the visual feast begins. Your eyes are immediately drawn to the massive glass window framing views of the 20m heated lap-pool with jacuzzi & electronic safety cover, expansive patio & wet bar, built-in gas braai and terraced gardens. Bespoke to the last detail, thought has been given to the combination of function and beautiful design evident in the triple volumes, effortless floor plan and abundance of natural light. Every element of this home has been designed & built to latest European Standards to efficiently manage and control heat loss and gain. This masterpiece will enhance your life and style. Constructed on 3 levels connected by its own elevator, the basement holds a 12 -16 car garage, fitted cinema, cigar lounge & wine room. It also houses the heating and cooling systems, server room and storeroom. Access to the main house is electronically controlled and protected by bullet-proof glass. The ground floor hosts the reception rooms which include a separate entertainers lounge and dining room with 200-year-old carved French Teak door perfectly juxtaposed against its glass frame and a fireplace & sliding doors to the exterior, a family room open to the gourmet designer kitchen, patio and Zen courtyard with Koi pond, a gymnasium & completely separate guest apartment, plus wonderful staff accommodation. The first floor is sealed off and protected by electronic controlled access and a sliding bullet-proof door. It holds 5-bedroom suites including a magnificent master suite with views to the Magaliesburg, his & hers dressing rooms, a spa room, study & pyjama lounge. The second dwelling is a fully functional home with open plan living areas to patio with stacking doors and private garden, 3 bedrooms, garaging and more. Ideal for the in-laws, guests or your off-spring starting out in life. An exercise in excellence this exquisite offering must be seen to be fully appreciated. It’s completely “off the grid” (Solar Photovoltaic System with UPS back up) and has an abundant borehole. But words alone cannot do this design triumph justice. Call to arrange a private viewing today.